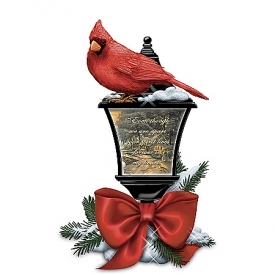 Thomas Kinkade, the beloved Painter of Light™, brightens our spirits with the masterpieces he created. Now, his uplifting artistry inspires a tender tribute to those special people in our lives who are no longer with us, but their warm, wonderful memories continue to touch our hearts. 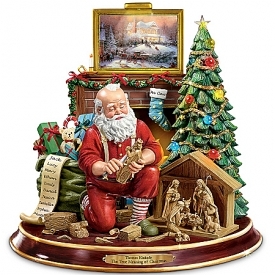 The Hamilton Collection is pleased to present the Thomas Kinkade Heaven's Embrace Figurine, an exclusive limited-edition angel figurine that warmly conveys the comforting thought that we will be united with our loved ones in Heaven one day. 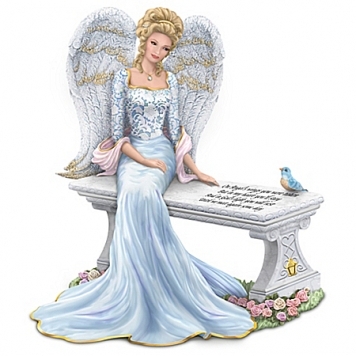 This glorious figurine is exquisitely handcrafted by Master Artisans with the finest detail, from each etched feather of the angel's wings to the meticulously etched lace pattern of her flowing gown. Then this lovely angel is hand-painted in soft hues, evoking Mr. Kinkade's palette, along with a special pearlescent finish applied to her ensemble and wings, giving them a polished luster that shimmers in the light.For added glow, her robe and sash are trimmed in metallic golden paint and more golden paint is gently rubbed on her wings. Suspended from the angel's necklace is a twinkling genuine Swarovski crystal, symbolic of your loved one's sparkling spirit and the uplift you feel when you think of them. A single teardrop falls upon the angel's cheek, but not in sorrow, rather in the joy of knowing that your loved one's memory lives on in your heart. Etched into the bench she rests upon are the comforting words: "On Angel's wings you were taken But in my heart you'll stay And in God's light you will rest Until we meet again some day". The artist's golden lantern shines on the side of the bench, while roses bloom with the promise of brighter days ahead. 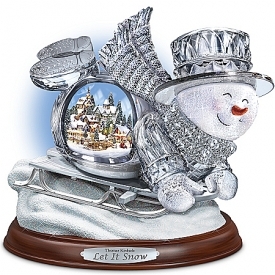 The Thomas Kinkade Heaven's Embrace Figurine serves as a touching remembrance to treasure for yourself or to share as a loving bereavement gift. We expect strong demand. Order now!